Dias&Riedweg, Under Pressure - Macro Testaccio, Roma (2017). A: I would like to start by asking you about the enigmatic and poetic title of the exhibition at Macro: Other Time Than Here. Other Place Than Now. Why this title? What is the relationship between time and place in your work and in this Roman show? 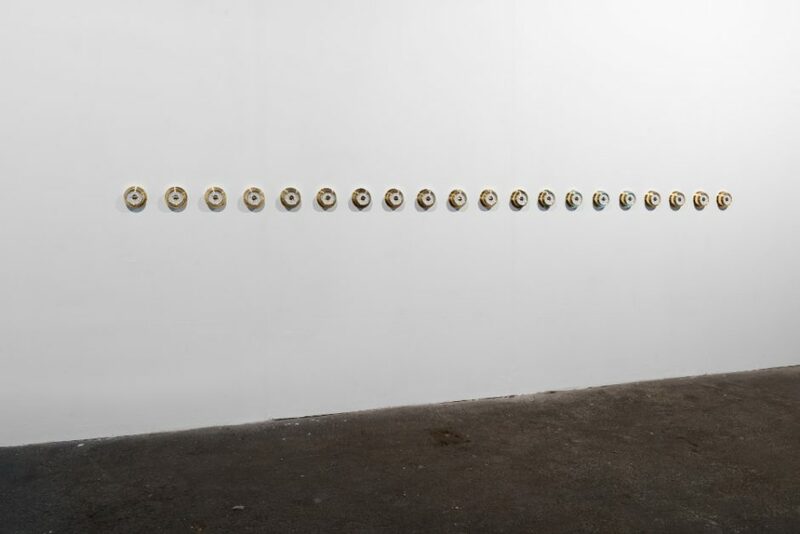 W: One of the exhibited pieces, Moving Truck (2009-2012) is very appropriate to explain the relationship between the axes of time and space as we approach the subject in this show. We have projected videos from the inside into the back of a moving truck – trucks used to move from one address into another – and then recorded it. We have done it in different cities and in each city we did this same intervention: we projected the previous video of the moving truck driving in the city before. Thus, the previous truck of the previous city, which was the support of projection, became the screened filmed in the new truck moving through the traffic in the new city and so on. All the trucks were video-recorded and the recorded videos were then screened in the following truck until we have made seven interventions in seven cities. Actually until the first recorded truck disappeared into just an unremarkable pixel in the image… they all moved in space and in time through a period of three years. Thus, the final result was a truck inside a truck inside a truck inside and so on… all moving in the traffic. I think it is a clear metaphor of how our own mind is also working, that we always have different memories of different spaces and times, which we carry all together somehow inside ourselves, even if the starting point disappears. These are inner spaces but all comparable to the outside world. These different layers of space and time make us feel present in one actual moment and location and do interfere in our perception of time and space in an ambiguous but real presence. We are vulnerable when we relate to the real time and space because we also carry an inner world inside us where we are. It is poetic and it is a human condition. M: I would add that we wanted to center the exhibition on the issue of migration and this is what connects all the pieces we chose. 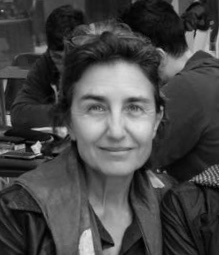 When we generally talk about migration, we refer to the displacement of people in space and the political consequences of it, but, very often, or quite always, we forget to mention what happens in the axe of time; how the life of someone really changes with migration because it is not just a displacement in space but also a displacement in time. When people migrates in a lifetime they do not just want to depart from one place into another but they also want to depart from a certain situation, from a certain time so as to move into a new time, a new life in a new time frame in a new space. So we thought about mixing the concepts of time and space already in the title, provoking some poetical confusion to something, which is conceptually established, when in truth it is not! Maybe when we speak about migration we should always evoke this confusion. So Other time than here, other place than now would be a very clear, a very confusingly clear, statement about how we should not separate these two concepts of space and time when we talk about people’s lives and about migration. W: All of us we carry these many different times in any space, especially in Rome where we are confronted with so many layers of history. We could think we all constantly navigate in time and space. A: The subject of migration does not only belong to your way of living (between Europe and Brazil) but is central to artwork since your beginning as an artistic duo in 1993. W: Focusing the show at Macro on this topic seemed to all of us not only appropriate considering the Mediterranean crisis and the massive waves of mass migration through the Mediterranean Sea into Italy and Greece in these last years, but as well considering what the city of Rome represents and has represented throughout history. M: The first decisions were taken when the three of us started speaking about which pieces would make a good ensemble. And as Walter just previously mentioned, Rome is maybe one of the places in the world where it’s most evident and where the most quickly you get this idea that the displacement of things and people in space produce a new certain cultural quality for an entire time. I think we chose well this pairing of time and space to talk about immigration and to talk about this in Rome. Rome is somehow and has always been a gate through Europe and Africa, a gate at the Mediterranean, a gathering point of mixing cultures. It has been that throughout history and still is. This is part of our choice to make a new project about immigration in Rome. Then, of course we have worked about this subject before and we keep very interested in following this issue. We try now to connect the recent immigration waves and paths from Middle East and Africa through Italy and Greece into Europe with a broader approach to the old history of the Mediterranean region and of Humanity. That was the starting point. A: The new work, Home of the Others, deals with the crucial issue of refugees in the city, a helpless situation, which becomes more and more urgent. In a very short span of time, almost as anthropologists working on site, you personally experienced the life conditions of these people, discovering an unsuspected side of the city, its hearth of darkness. How was your working process? What was your approach? M: Once we arrived in the city, we received information from you and from the artist Marco Passaro, whom we met at the No-Working and the Stalker group1. That led us to meet with the group Baobab Experience2. This was crucial and what we could see at the refugee camp behind the Tiburtina Train Station was in a microcosmic way what we had read in the media. Some of the impersonal stories that we were reading in the media for very long time were suddenly there, in a small scale but on the other hand like under a magnifying glass coming out real to our eyes. There were names, there were real people instead of stories or cases. We could listen to them, we could see these people and also see the difficulties of the situation in which they find themselves and the hopelessly difficult political situation in which they are. This is how it started. W: In the few weeks we were there, one night at the camp, the wind and the rain destroyed many of their tents, so the people had to redo all. This was an episode but an episode you experience yourself can be stronger than much theory to find a precise way to talk about a difficult subject, especially in an art project. Difficult subjects are difficult stories to tell but these stories have to be told. So we focused on apparently simple and really collective matters, such as the rain fall, the cold weather, the camping and cooking… daily things that everybody deals with, to approach this very particular difficult subject. M: Our decisions were strategically taken as we finally met with those guys and also faced the very basic barriers and difficulties of doing this work, because they are in a situation, which is very unstable and with not much dignity. And as in any situation in which there’s not dignity, we, all of us, intend not to wish to speak about, not to show ourselves, not to be seen in this. So, there was this kind of trap because we had to make that visual, we had to make this lack of basic dignity visible and to talk about while, on the other hand, we clearly understood that they did not want to talk about it, because they didn’t feel it’s something dignifying for their existence. It’s a moment of their life that I think they wish to forget, to erase. At this step of immigration, they are in a non-space… they are not in their homeland but they are not yet in their dreamland. They are moving and waiting and this time is full of harm, full of pain, so that they clearly do not want to talk about it. Dias&Riedweg,Home of the Others, Macro Testaccio, Roma (2017). A: I remember that our discussion was precisely how to deal with this issue without manipulating it, without manipulating the people we met. Your way of dealing with this issue is never literal, on the contrary, it always shifts to a poetic, almost philosophical level. M: Our question was how to materialize, how to visualize something about others’ lives, about which they do not want to speak about it. This was our artistic conflict and the strategy that we decided to adopt was to evoke the similarities, the common things we all share, like the sky, the birds, the weather, the cold, the hunger, the wish, the dream. All this in a more philosophical way, in an open way in which they themselves can still relate to other people they don’t know and who will then see their statements later in the video, and also our own way to relate to them when they see it. It is important for us to bridge this gap and not to make an isolated storytelling about the immigrant, like what the press constantly does. The press mentions stories or speaks about numbers and statistics, so that people consume them in a very cold and passive way. We cannot react to a matter when we cannot connect to a matter. Our strategy instead was to go in the opposite direction, and not to stay in a specific storytelling of their problems because this is broadly already told and documented, but to work on the possible empathies, on the possible relationships that we can all have as human being, sharing the same ground, the same sky, the same views, the same weather. This is why these general conditions are very present in the video. W: This is as well the reason why we filmed the birds flying in the sky of Rome, over the MAAM3, which in their migratory flights from Africa reproduce exactly the same routes of the refugees. As human beings we all share these basic movements, we are all under the same sky, at once and since a long time… This helped us to make a piece that talks about very basic issues of movements and of feeling safe. A: The fact that the video is without sound I think it enhances the abstractness you are looking for, while emphasizing the crude conditions of their realities. M: The video is soundless, there are no words, there are no statements but instead there is always the sky and the weather. We can see how the people react to them, and this makes visible in which ways we differ because of our social conditions. When we feel cold we put on the heater, we do not go out to make fire with rests nor we put on some more layers of the same thin clothes, but they cannot. They can just put some more layers of plastic on their tents and they have nowhere warm to go in. If it rains heavily and the tent gets rotten, they get wet and cold, they try to make fire but they do not have dry wood nor gas, they just have rests of wooden garbage that they pick up from the street, because generally it is meant that if they would have wood they would have to have an axe and this could be a weapon, and there should be no weapons in a territory of conflicts… Their condition is reduced to a primitive situation of living. W: We thought that this is interesting because basically we are all primitive. If we get out of our comfort zone, without our passports, without our homes, heaters and clothes, we will be there exactly where they are. So, our strategy to make this visible was to connect these apparently disconnected territories of the general public and of these refugees. A: The emphatic attitude is at the core of your working method. How are you dealing with political agenda and empathy in your work? M: We talk about urgencies, we do not talk directly about the immigration problem, we talk about urgent conditions and this is in general what guides our work. I think that in our case the political agenda is the empathy. 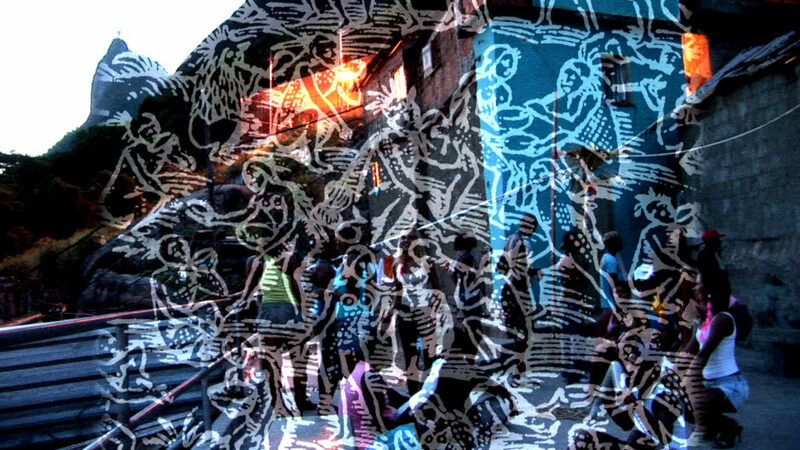 The empathy that guides us towards the immigration camps is the same that guided us to work in favelas for over twenty years, it’s the same empathy that guided us to talk about riots, about clashes and about territories of conflicts. We believe that it is in these territories of conflicts that we can get to a basic ground deployed from zones of comforts and conditionings that culture creates, and therefore aren’t all real. Thus, we give a big emphasis to the empathic attitude and this is the way we approach each and every work we do. In the first place we have to be in a kind of empathy with what we are talking about and then we go for the political agenda, because basically we are much more interested in what is connecting than what is disconnecting us. W: It is also a way to avoid false promises because the work we do is possibly highly political but it is still within the artistic field, in the field of interpretation, representation and documentation. It does not go beyond. Some side effects may come from this work, some people may use it as a step to change their lives but this has nothing to do with us, it has to do with them. A: Your projects are often context specific and collaborative, based on the sharing of experiences. M: Many of the projects we do are collective or participative processes, in which people that are not artists also work in an artistic experience, sharing some artistic strategies and pleasure of a different kind from consumerism. There are other possible ways of experiencing art, which are not merely contemplative or educative. Like Suely Rolnink wrote, ways that activate the vibrant body of people. 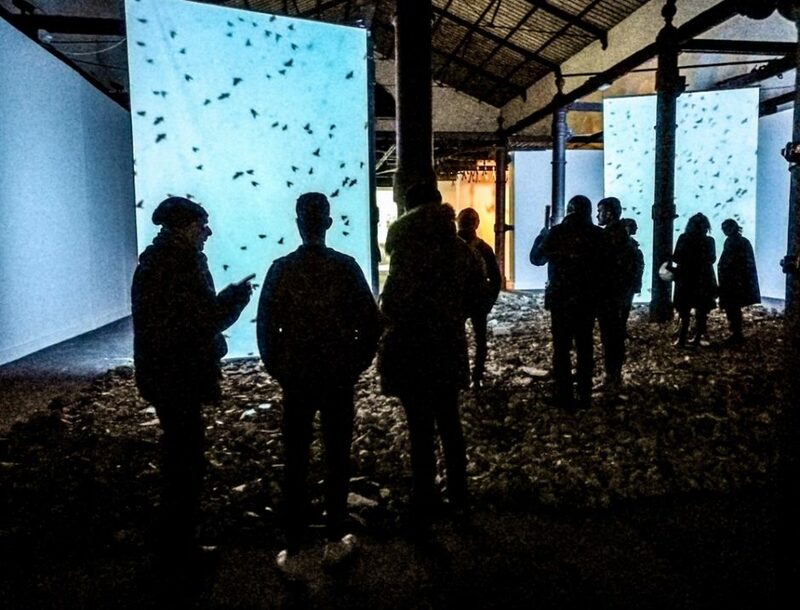 This can be done with the viewer who sees the installation but it can also be done directly with the people participating in this kind of experience. The ways they react to such a process are very diverse and really depend much more on them than on us. We basically have the same approach to the entire group, if it’s a group and mostly it is and the people still react very differently. W: We once did a project about immigration called Inside and Outside the Tube (1998), developed in a Reception Centre for Asylum Seekers in Adliswil, a small town near Zurich. Besides the cultural representation and the presence of immigrants within the art territory, that project caused much discussion… There was the possibility to make a radio broadcast at the Swiss National Radio and a tour with national politicians in the area of the intervention because it was a work in the public space around one of those Durchgangszentren, a center for the reception for asylum seekers even before they get their status of refugees. For us the challenge then was to avoid showing their faces and identities in videos because this could disturb the relation between them and the political process that they were going through. But also, they were afraid, it’s more about fear than about real interference. So we did an audio work, which built an itinerary in public space like a promenade within this village and a broadcast in the national radio. M: You would walk in public space listening to parts of these audio conversations that came out of heating pipes that were already existent in town, and you would get a certain perception of this village stated by this group of asylum seekers, you would get to see that city how the refugees perceived it. Part of the information was still missing but there was their perception. There was that particular experience, and somehow that was the tool that brought together politicians to that place and many asylum seekers could actually reach the refugee status and remain in Switzerland. But again this is still casual. We love when the work serves as a tool for people to improve their lives, to achieve their goals but this is simply not something we control. We try to employ strategies that can be used by them or by other segments of society but many we cannot resolve. The territory of conflicts remains there. A: You have established an artistic practice based on relationships and on dialogue. What is your approach and how do you see your role as artist? W: Formally our work is sometimes almost like a musical composition. We move abstractly, keeping a philosophical context that maintain complexity from a very specific story into a more general context. I think that this is how an artist may contribute within social matters: to insist on a more complex understanding of our own conditions as human beings. M: To create conversation is the main tool of our work, I think that there is a need and a possibility in creating conversations in territories of conflicts where there’s no possible solution and possibly there will not be, but insert conversation do bring relief, do bring some light and this is positive, I think. W: We try not to present finished stories, but fragment, so that the audience stays as an active player. We offer a context for reflection and reflection is a complex individual process. M: I think that the material we have used is not construction material but rests of destruction. They had been constructions that were erased. This was a way for us to connect the ways we all talk about immigration to the matter of housing, of living. Because it is very hypocritical to criticize nomads and immigrants when we abuse of the surfaces that we use to live. Rental is very expensive, buying properties even much more expensive, and we know, we all know that at the roots of this matter of immigration there is obviously the question of property at a very basic level. People who migrate want to reach out for a place to be. It is not about property of a space but property of the rights to be somewhere. They just want that, they do not need to buy property, but they want to be in a property, they want to have a space, to possess a space to be. Everybody needs a place to live, to sleep, to work, to eat, to stink, to be there. W: On the other hand, a lot of the discussion about immigration has been heavily guided by those who own property and are afraid of losing it… losing square meters, losing money and losing power. It is in the basis a problem of sharing and the idea of using construction rests as the installation floor, is to emphasize this, to create another level of connecting who watches these videos to the people represented in them. This same thought made us decide to use the weather conditions in the videos. To share in the video the things that we share or should share, such as the weather and the floor where we walk. A: Both are the imaginative elements you have conceived to create the metaphorical shift you are looking for in your art. They function as poetic devices in creating a work which is both document and work of art, both ethic and aesthetic. The other important element can be seen in the manipulation of the time in the videos. M: This is perhaps the most sophisticated effect of this work. In some parts of the videos there are two different speeds: there is a certain speed in the sky where the clouds are passing very quickly but not on the ground where the rain does not dry and where the soccer play or the card play are in normal speed or yet the fire burns in slow motion. So, there are different perceptions of time in the same image, what we could call Kairos as opposed to Chronos, the time of the subjective perception versus the objective social time that regulates us all in society and makes it possible for us to share space. 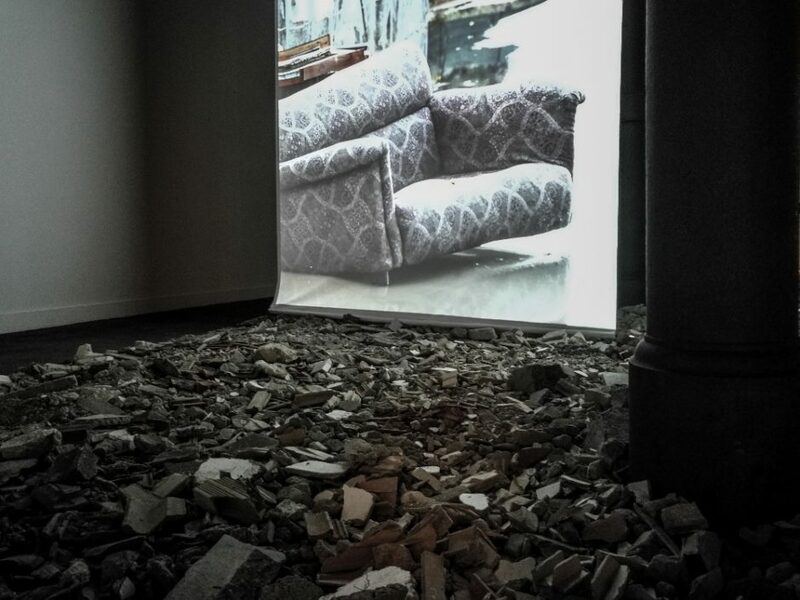 W: There are these two fields of subjective information in this piece: the presence of different times in each moving image with the mention of the weather, of the cold, the silence, the fear; and, physically, the installation of the floor covered with seven trucks of construction material in a destructed state. I think, all together, this brings another possibility of approaching the issue of immigration including the two poles of it, the people migrating and the people trying to control migration. Because migration is an issue for everybody, not just to those who are migrating, but to those who are already somewhere, because the space and the time are constantly changing. Dias&Riedweg, Funk Staden. Auditorium Parco della Musica (2017). A: The exhibition at Macro gathers works from 2004 up to the present but has been carefully conceived almost as a unique work of art where each piece resonates with the others. Could you speak of the sequence of the works in the exhibition and their relation? W: We start with the Italian version of Big Bloc (2014) – the 80 posters containing 80 statements spoken by politicians and celebrities mixed with some other sentences by Ionesco and Becket -, which, set together, open up a whole variety of thoughts and a certain critical tone to the on-going Realpolitik worldwide. These posters accompanied by the video-installation Moving Truck and the series of video-objects Suitcases for Marcel give the dimension that any displacement of an idea, an object and obviously also of people in space, produce new meaning. M: That is why we prefer to use the word migration instead of immigration. Moving Truck (2009-2011) and Suitcases for Marcel (2008) directly evoke this idea while the new installation Home of the Others (2018) touches this same idea as a participative project focusing on the immigration matter. 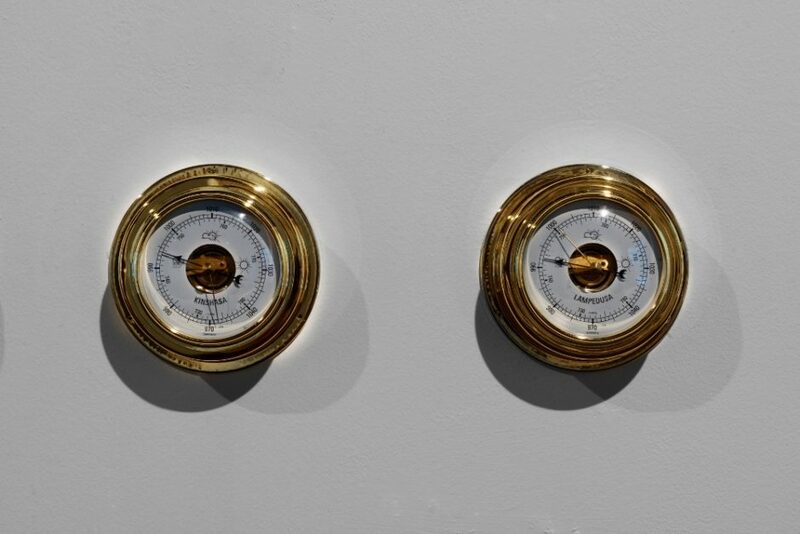 Further down, the piece Under Pressure (2013) shows a line of barometers hung on the wall where we can read the room temperature but also the names of cities in the recent migratory fluxus from Africa into Europe along with images of riots and urban manifestation in the piece Hot Coals (2014). Finally the video installation Flesh (2005), encloses the exhibition at MACRO Testaccio – a former slaughter house – with images of slaughtering that may indicate how the consume of meat in different cultures is a fact, thus reflecting on co-existing but different perception systems about life and death in contemporary times. 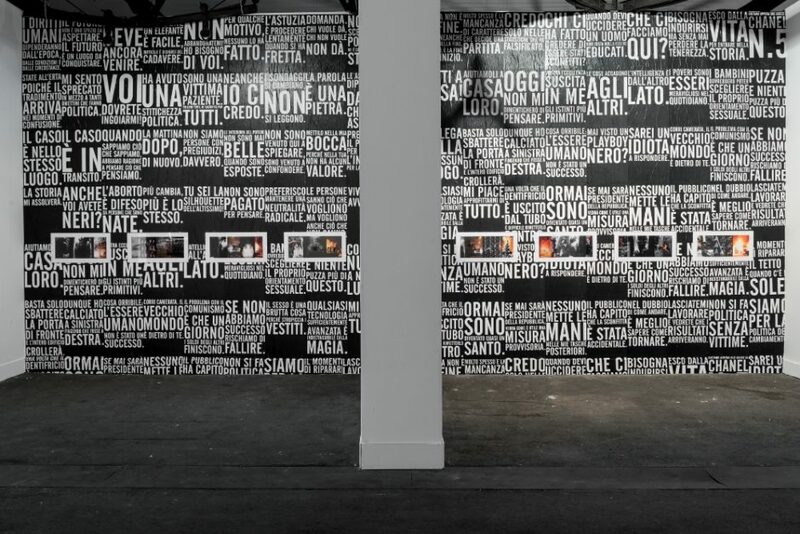 A: Where is the connection, if any, of the exhibition at Macro with the one at Auditorium featuring Funk Staden, the work produced for Documenta in 2007 and shown here for the first time in Italy? M: They certainly do not have the same atmosphere but I think if we look more carefully at both shows, we find out that they are done by the same artist. 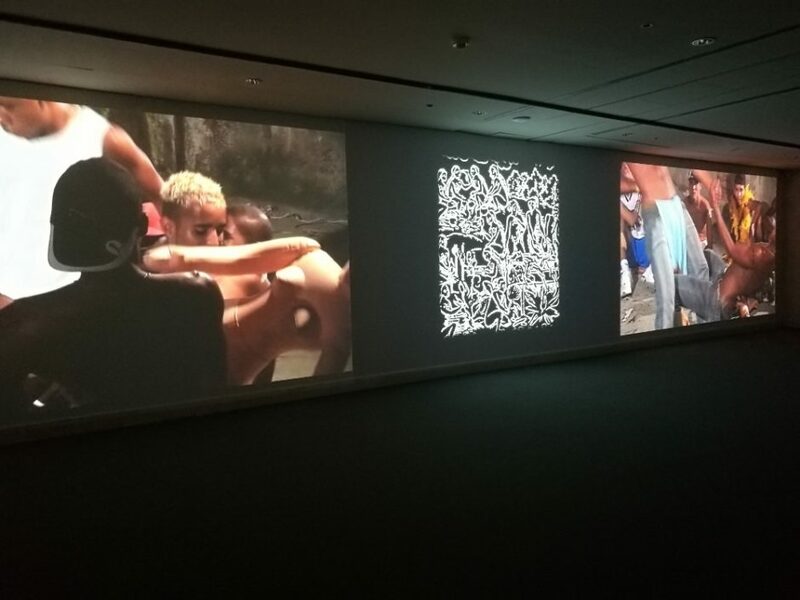 The group of works that are shown at the Auditorium (the three-channel video installation Funk Staden, the single video Book and the five photographs entitled Woodcuts) are not dealing with immigration in contemporary time, but they do relate in a broader sense. If we go back to the 16th Century, when Staden left Kassel to join the Portuguese expedition and ended up shipwrecked at the seashore of what would later become Brazil and later wrote his book (True Story and Description of a Country of Wild, Naked, Grim, Man-eating People in the New World, 1557), he invented the mythology of the cannibal, the primitive wild man of the tropics that would eat the European forever, I think that this relate to the perception that Europeans may have about the wild men from the tropic as being similar to what they think of the wild immigrant from Africa that are trying to enter their space. It’s different but it’s related. W: The Funk Staden video ends with the pages of the 500 year-old book, turning into the waves of the Brazilian seashore today. It’s an attempt to wash up History, to retell this old story and to relate to the way we do it now, because the ways that Brazilians in general deal with the favelas are not so disconnected to the ways European deal with the Africans that are searching for an entry in Europa, for a place to live. M: Both groups of works (at Macro and Auditorium) focus on different things but both are pointing out a possible criticism to the ways we share space and History, to how we construct History. Because we simply build up our History on the history of power and very often, or quite always, we tend to forget a good part of the people who are left out of this official History, like the Tupinambá were left out, there is no real record about these (cannibal) Indians… We don’t even really know how cannibal they really were. There are no artifacts left, there is no serious documentation left, what’s left is Staden’s History and again another religious Christian register written by Frei Sardinha, a Portuguese priest that was in another expedition. He is the only other author who has left documents of these times but they do not tell anything really careful or precise because they are mere literature: Christian literature to defend European dogmas, to defend European authority that legitimated colonization in Brazil and in many other places and still legitimates the quite horrible ways we deal with Africans nowadays. The way we are relating to Africa is, in my opinion, a big mistake and will become worse. The whole thing about sharing property, sharing goodness, is based on capitalist thinking, of accumulating power and not really sharing it and this is a big problem. A: The construction of History and its manipulation is a main issue of your work. W: We have one work, which was done in 2004 for the Liverpool Biennial and shown at Tate Liverpool, that mixes the times of Mercantilism and its trading routes between the Americas, Africa and Europe with the problematic of the asylum seekers nowadays. It’s called Sugar Seekers (2004) and it was done with nine Africans who were asylum seekers in collaboration with Fact, Tate, and the Refugee Action in the UK through that entire year. It was another kind of approach, we spent a considerably long time with the refugees. It was based more on discourse than on existent images. W: We suggested developing a project of participative archive, a virtual platform on immigration and emigration that could document and connect people, through their stories and images. This participative platform, organized by the immigrants and Baobab directly could give access for other individuals, families and future generations to understand what really is happening. There were 22.000 people killed last year in the Mediterranean, drowning, and this is horrendous. If we do not create a context that refers not just to tragedy, but also to these recent lives and losses, I think we may loose a whole story, like we lost track of the real Tupinambá history. M: About the Baobab archive, we just raised the idea, it is not yet done, we are hoping it will be developed but it is not something we can carry on ourselves because it really depends on the Baobab group, on what documentation they have, but the idea is to realize an archive as a tool to contradict such strategies like Hans Staden’s or Frei Sardinha’s, who invented History. The idea is to create a participative archive, with an organic always-growing database where people can insert their fragments and these fragments could build up a more realistic possibility of documenting history for the future. M: Funk Staden is already this, we are quoting an archive, we are quoting Hans Staden to contradict his archives with the Funk dancers, with what they are now, what the Tupinambá possibly became, and here I include myself also as a Tupinambá descendent, what we became. Things cannot be so disconnected, we cannot allow this disconnection in our way of building up History, because this is what we teach our kids, this is what we believe we are, this is the way we make History and we cannot go on thinking that History is something finished because is not, it is just continuous. W: This is why we mentioned this world as an un-finishing or un-finished conversation, because everything is also a process. We can freeze certain moments to refer to them, we have to freeze a thought, a statement, in order to speak it out but we cannot believe in it forever. We have to constantly question it, we have to question ourselves in order to exist further. This is very important. M: We question ourselves very little and our politicians easily lie at their convenience… they do not even realize how contradictory they sometimes are, trying to deal with an established reality when reality is in truth always going on, it’s always changing. It is the one important aspect of the artistic attitude and the artists’ role today… be aware to check and to redefine the state of things as life moves on. Therefore, if art is contemporary, it’s always political. 1. ↩ Stalker is a group of architects, artists, activists and researchers that came together in the mid-1990s, working experimentally and engaging in actions to create self-organized spaces and situations. 2. ↩ Baobab Experience is an association of activists and volunteers who since 2015 are trying to deal with the emergency of immigration, organizing hospitality shelters for the refugees in transit. Their camp is still illegal and is currently open air at Maslax Square behind Tiburtina Train Station. 3. ↩ MAAM – Museo dell’Altro e dell’Altrove in the ex-factory Fiorucci at the ouskirts of Rome started in 2012 to defend and protect with site-specific works of art the housing emergency of the people, a variegated and diverse community, who squatted and lives in the building.